Today, in case it had somehow slipped by you, is Earth Day. I began receiving notifications that it would soon be Earth Day about two weeks ago. 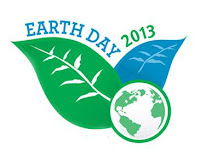 In my email inbox this morning, I received "Happy Earth Day" messages from a t-shirt company, Aveda, a homeschooling organization, Williams Sonoma, Lindt Chocolates, and many others. But how should Christians think about Earth Day? And what, if anything, should be our response? Let me first note that, when I was a New Ager, we were ALL about Creation worship, sometimes called Gaia worship. And please note the capitalized "C" of "Creation worship;" we sincerely thought creation was imbued with divinity. I didn't know it at the time, of course, but I was a direct fulfillment of Romans 1:25, which states that "They exchanged the truth about God for a lie, and worshiped and served created things rather than the Creator.....". But I can honestly say that never in my wildest dreams, as a practicing New Ager, could I have imagined that one day the earth worship we had in our little fringe group would spread to the rest of the world and even into Christianity. And yet, I've seen Green Bibles, Green Bible Studies, Green Christian websites, etc. Now, it's not wrong, of course, to take care of the creation, but we must not give it more value than God has ascribed to it. God has told us in his Word that one day He will create a new heavens and a new earth. This means that this earth is of finite, limited use, and will one day be gone. And again, I'm not saying we should trash the earth: we are told in the Bible to be good stewards of it. But we must not revere it, and "Green" anything that I see inside Christianity literally makes the hair on the back of my neck stand up because there is a very fine line indeed between being a good steward of the earth in a biblical, balanced way, as opposed to letting your everyday decisions be framed by the environmental agenda. But to my dismay, I now recognize that this movement is so completely mainstreamed, that it often does frame our thinking in many of our decisions, from what car we will drive (electric vs. gas-powered), what paper products we will buy (recycled paper products vs. regular paper products) what items we will purchase (those produced by sustainable organizations vs. those not), etc., etc., with some kind of inherent moral virtue often implied in the purchasing of the "green" products. We urge individual Christians and churches to be centers of creation's care and renewal, both delighting in creation as God's gift, and enjoying it as God's provision, in ways which sustain and heal the damaged fabric of the creation which God has entrusted to us. We recall Jesus' words that our lives do not consist in the abundance of our possessions, and therefore we urge followers of Jesus to resist the allure of wastefulness and overconsumption by making personal lifestyle choices that express humility, forbearance, self restraint and frugality. All right, that right there is where the rubber meets the road. It sounds so good on paper....as so many theories and ideas do, but try living that out. Many parts of this country have been hit hard by the recession we're in, and let's say a Christian man, wanting to make Godly choices and walk righteously before his Lord read the above call-to-action to only work at corporations that are sustainable, green, etc., and so he made the decision to do that because he felt it would be sinning otherwise. Should he starve to death, and let his family starve to death, if he couldn't find a suitably green company to work for? As noted by Christian researcher Marcia Montenegro, this kind of thinking is "a type of legalism and judgment according to man's standards, and not God's. God tells the head of the family to provide for his family or he is acting worse than an unbeliever ('But if any provide not for his own, and specially for those of his own house, he hath denied the faith, and is worse than an infidel.' 1 Tim 5:8 - this goes for single mothers, too). That is God's mandate and that overrides working only for 'green' companies." So as far as how Christians should think about and respond to, Earth Day, I think it's pretty straightforward: we should be guided by Scripture, not worldly wisdom about what products to buy or what company to work in. And as far as "evangelical environmentalists," how should we respond to them or think about them? For myself, I have certain criteria that I often hold in my mind when visiting the website of any kind of organization pertaining to be Christian. It goes something like this: What should I see when I visit a website that claims the name of Christ (such as the environmental site linked above)? Should I see Jesus Christ, the God-man, who came and fulfilled God's laws perfectly, and who died for sins, and was raised triumphantly from the grave to reign and rule over all the earth? Should I see Him exalted, magnified and glorified? Or should I see a rather worldly message, designed at piggybacking onto whatever trend is currently captivating people? Well, it's kind of a no-brainer, isn't it?